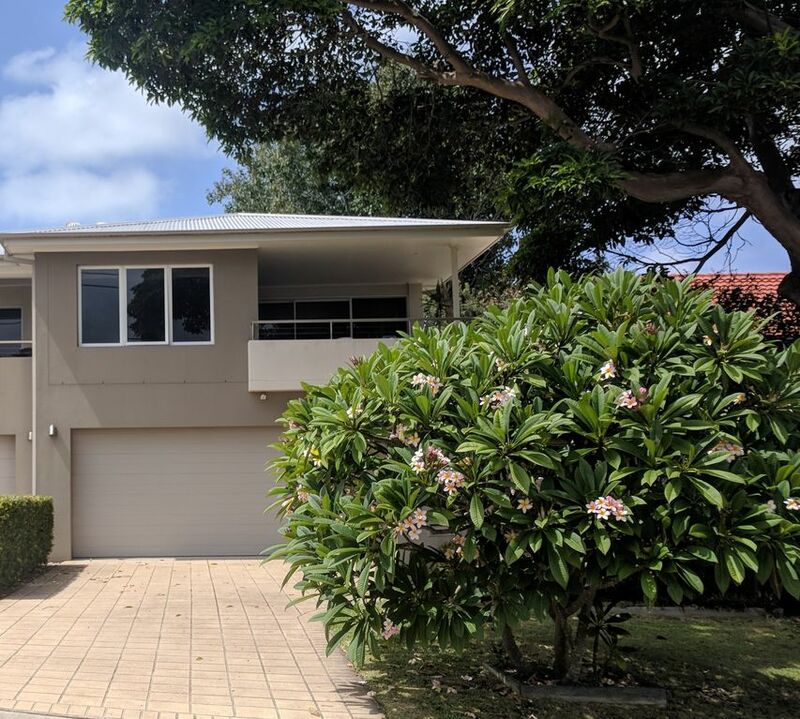 This modern, well-appointed 4 bedroom duplex is set in peaceful surroundings yet is only a short stroll from D'Albora Marina, Nelson Bay shopping village, cafes, restaurants and is only a 150 metre walk from the beautiful, family friendly Dutchies Beach. Located in Nelson Bay's most prestigious street, this property provides for a dream family holiday escape. Fully self-contained this duplex accommodates up to 10 people (including children) with two bedrooms upstairs and two bedrooms downstairs. The bedding configuration is as follows: 2 Queen rooms and 2 Bunk rooms with double on lower bunk and single on upper. Please note the bunk beds are most suitable for children and the top bunk for those over the age of 9 years. We offer linen packages as 'optional extras', where you will be supplied with hotel quality sheets, including provision of bath towels, bathmats and hand towels. Cot & High Chair are also available for hire. The open plan living and entertaining areas are located on the second floor, bound with views of sparkling Dutchman's Bay through to Soldiers Point, and open up onto a spacious deck fully equipped for the perfect BBQ. Please note that you will be required to bring all consumable items. We do have strict policy in relation to 'visitors' to the property thus only those nominated and accepted on our booking form are permitted to be on the property. This property is not available for parties or functions, including end of school or uni group holidays, Bucks and Hens parties. For your added security, this property - Dutchman's Bay Escape is only managed in Australia and we never request payments to be made to overseas bank accounts. 5 sisters gathered a special birthday. We were close to the waterfront to walk to the Marina and close enough to walk into town for dinner. We stayed here for a week and really enjoyed our time. The house was very clean and the furniture/furnishings in excellent condition. Decor was modern and tasteful. Venessa, the owner, was very responsive and helpful. Location is great and the house is in a quiet street. We didn’t hear any noise from neighbours or other people. The top floor of the house has air conditioning which worked very effectively. Downstairs (2 bedrooms, bathroom, laundry) wasn’t air conditioned but we found the temperature to be OK. I did notice there were portable fans in bedroom cupboards downstairs so they are available to use (we didn’t need them). In terms of negatives, one adult bedroom didn’t have any reading lamps. The other adult bedroom had a reading lamp but it wasn’t working. We also felt the dishwasher was a bit small (just one shelf) given the size of the house and the number of guests it is designed to accommodate. We did quite a lot of cooking during our stay and would have appreciated having sharper knives to use in the kitchen - they were pretty blunt. The house has a lovely outlook and the outdoor seating near the BBQ was a great spot to sit while enjoying a meal. We also appreciated having Foxtel channels on the TV. Dutchies Beach is a fabulous spot and an ideal beach for young children. Recommended! We had a lovely time, walking distance to the beach and the town. Great property in a perfect location! Very well maintained property. Plenty of space if staying with 2 families. Within walking distance to Nelson Bay centre which makes it very convenient. We only had the opportunity to stay for two nights as it was a work trip but enjoyed it. The place was clean and tidy and easy to get to.